If you ever rollerskied over rough road, you know it quickly fatigues your legs. The constant vibration stresses your balance, and the shaking and rattle steal your power. 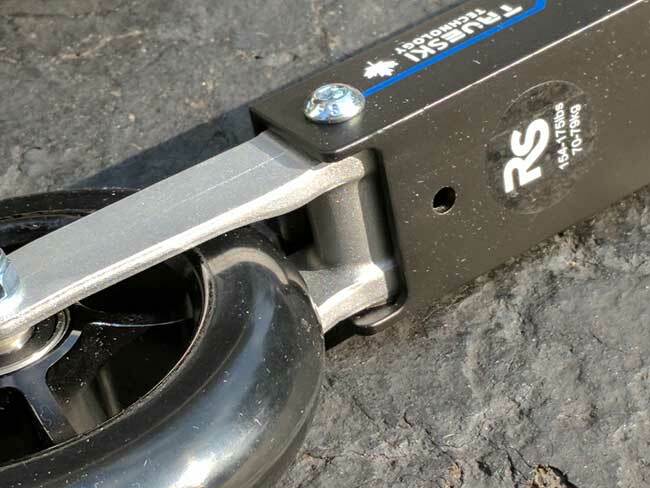 Any rollerski that can dampen the vibration is going to feel more ski-like, but more importantly, it's going to reduce fatigue and let you get in a more effective workout. 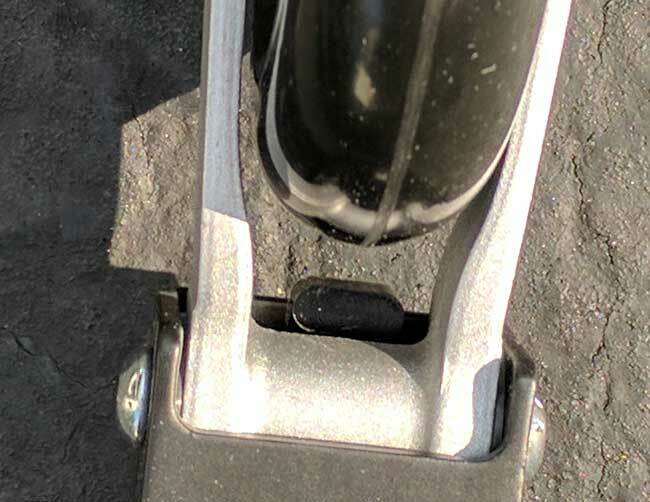 Pneumonic-wheeled rollerski, like the V2 Aero, do provide damping, but at a cost of higher center of gravity and higher weight. Technology advances, and rollerskis with dampening have been appearing on the market. Rundle Sport's RS-10 came out circa 2015, followed by Pursuit's ForkFlex in 2016, both awesome skis for rougher pavement that also perform great on smooth pavement. They are also relatively light. 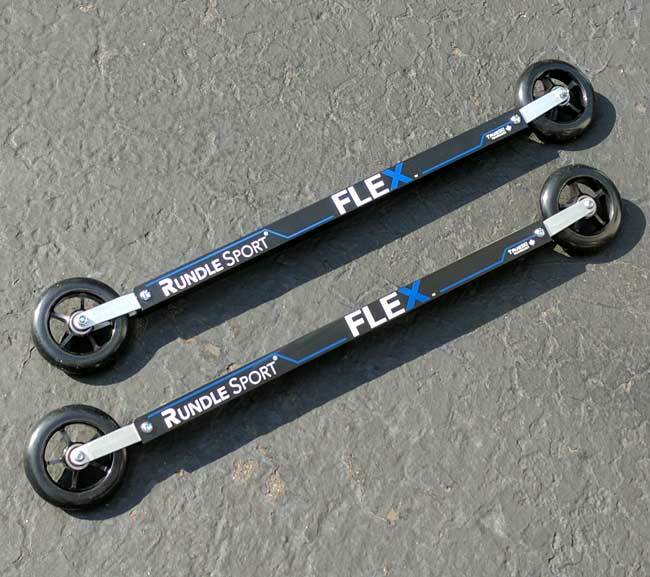 Rundle Sport has evolved the RS-10 into the new Rundle Sport FLEXtm Skate Roller Skis. The main difference is the new 2017 FLEX Suspension Arms that lowers the body of the ski by 7mm for increased stability. A full set of rollerski parts can be bought, including the 2017 FLEX suspension arms. In fact, you can upgrade your "old" RS-10 rollerskis with the 2017 FLEX suspension arms and fenders! The pictures do not show the fenders - they skis shipped with the fenders off. For testing, I left them off. Alas, I was sent a pair of FLEX Roller Skis this summer, but they arrived without bindings, and it took quite a while before I could dig up a pair (thanks Ricardo Lung!). And by that time, my day job took over my life and I was banned from rollerskiing by my doctor because I was on blood thinners and a blood clot that had led to a pulmonary embolism. So this review is very late (sorry Rundle Sport!) and I had to do it using teammates from Team NordicSkiRacer. I asked Ricardo Lung and Tony Percha to compare the FLEXtm Skate Roller Skis with their current rollerskis over a wide variety of pavement. I also asked them to provide a little background on their experience with rollerskiing. We mounted a pair of Salomon SNS Pilot bindings for testing. Having the holes pre-drilled made the job easy, particularly since there are no cross country ski shops anywhere close (we're talking about driving HOURS to find a decent one). The only issue is that you can't optimally place the bindings: the best place for the binding is as far back as you can get it. This moves the pivot point on the binding back so the front and rear of the ski are more in balance and the rear wheel doesn't drop as much. I've been roller skiing for about 8 years and I currently own the Marwe 610 Skate Roller Skis with medium speed wheels and plastic fenders on the front and back. My Marwes are outfitted with the Salomon Pro-link binding and I use Madshus Skate boots with them (NNN). For the Rundles, I used my older Salomon skate boots (SNS). I weigh roughly 150 lbs. The new Rundles seemed to vibrate less and reduce impact from bumps. It was difficult to tell whether the wheels were softer or the flex suspension system was the underlying reason. When I picked up the Rundles, they seemed quite a bit heavier than the Marwes, but I did not notice that when rollerskiing. They seemed about as stable as the Marwes and seemed to track in the exact direction you pointed them with a smooth roll. Overall it felt like a less impactful workout which may reduce fatigue in the long run. They were a little quieter than my Marwes (which are quite old). I noticed the back of the ski seemed to drag when I lifted the ski to plant it and this made the ski feel slower. This may be due to the location or design of the binding, but it was very noticeable. Although they did not feel unstable, I felt it was more difficult to shift my weight onto one ski when using a V-2 technique. The flex system seemed to reduce impact, but it also seemed to limit my ability to skate fast with power and shift my weight. I did not notice a significant height difference. I skied down a hill with three other rollerskiers (all on Marwes) and they all pulled ahead rather easily, so the Rundles were definitely slower on downhills. On climbs, the dragging of the back wheel seemed exaggerated. I’ve been roller skiing for about 1 year and I currently own the Pursuit Fork Flex Roller Skis. The Pursuits were set up with Prolink bindings and Botas summer boots (also Prolink). The Rundles had Salomon SNS Pilot bindings and I used my Atomic SNS winter boots. The new Rundles feel smoother over bumps. Not a ton but noticeable. Takes the edge off. Also, I noticed how nice it feels when you push off during the kick portion. It has a solid yet smooth feel. It’s been awhile since I’ve skied on snow but it actually reminded me of the same feeling! It does have a more snow-like feel which is nice. The graphics look cool too. Less stable then my Pursuits. They do sit higher then the Pursuits without any weight on them. I was a little more wobbly on them (felt taller on them as well) so there was a little less confidence. I'm not sure if this may have had an effect on the stability since the SNS setup may sit slightly higher on the roller skis? I suspect that would improve over time though (I’m still relatively new at skate skiing). Not a big deal but they are noisier too. I think it’s from the suspension arm movement. Also, I weigh at 175 lbs so I was on the high end of the weight range for the Rundles. My perfect roller skis would have the stability of the Pursuits and snow-like feel of the Rundles. I love the RS-10's for their smoothness and dampening over bumps. Both Tony and Ricardo agree. The skis track straight, have a snow-like ride, and look cool. Each had some issues (I'm thinking Tony's older, more broken-down boots allowed the rear of the ski to drop), but overall, these are great skis, particularly is you have chip and seal or broken pavement. You can buy Rundle Sport FLEXtm Skate Roller Skis from Rundle Sport directly (Canada) or from the US Ski Pole Company in the US. Rundle Sport has changed wheel manufacturers since the time of this review. All Rundle Sport skate roller skis are now assembled with the standard #2 wheels used by Swenor, IDT, Fischer, Pursuit, etc. The #2 wheels are both faster and more stable than the wheels tested in this review. 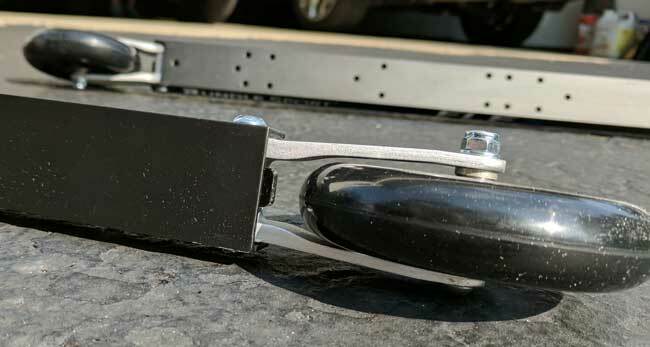 The FLEX roller ski fenders were not tested in this review but their extreme durability is noteworthy. A short demonstration can be seen here.